Boston, Mass. : Harvard Common Press, c2000. xii,643 p. : ill. ; 24 cm. Reproducing the incomparable taste, texture and aroma of handcrafted bread from a neighborhood bakery in a bread machine. 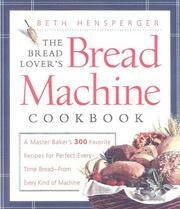 The bread lover&apos;s bread machine cookbook : a master baker&apos;s 300 favorite recipes for perfect-every-time bread, from every kind of machine / Beth Hensperger ; illustrations by Kristin Hurlin. 100 Personl Name ME 1 $a Personal name Hensperger, Beth. $c Statement of responsibility Beth Hensperger ; illustrations by Kristin Hurlin. 504 BibliogEtcNote $a Bibliography, etc. note Includes bibliographical references and index. 520 Summary Etc. $a Summary, etc. note Reproducing the incomparable taste, texture and aroma of handcrafted bread from a neighborhood bakery in a bread machine. 650 Subj:Topic 0 $a Source other than LC Bread. 650 Subj:Topic 0 $a Source other than LC Automatic bread machines.